At the recent United States Catholic Mission Association conference in Los Angeles on interreligious dialogue, Br. John Kiesler, OFM, presented a workshop on what insights we can draw from St. Francis’ encounter with the sultan. Today we share the first of two parts of Br. John’s workshop. Imagine we are in a museum filled with artifacts from civilizations of the Americas: magnificent sculptures and fine artwork accompanied by explanations provided by the curators. But it is all that we would expect from a museum dealing with ancient peoples. That is until we stumble upon a room in the museum highlighting ancient medicine and learn to our surprise that the ancient Mayans were doing rudimentary brain surgery over 4000 years ago, Certainly not brain surgery using modern technology and techniques, but nonetheless brain surgery. Who would have thought that in the past such things were possible? This is much like how often we view church history. Having read many books or, perhaps suffered through courses on the Christian past, it seems to be one dimensional and not too helpful for us today when looking at other world religions. Our focus is drawn to religious wars against the Lithuanians; persecution of the Albigensians; forced conversion by Charlemagne of the Saxons; and over 200 years of Crusades to recover the Holy Land. What could we possibly learn from our Christian past to help us in the task of dialogue in our pluralist age? Several months after this campaign began, the Crusaders had Damietta under siege and the war was at a standstill. At this time a small group of rather ordinary religious arrived at the Crusader camp. Being with the Crusaders only a short while, Francis of Assisi and possibly Brother Illuminatus, crossed the battle lines hoping to speak with the sultan of the Egyptians. Francis’ hope was to the convert the sultan and thus end the conflict. Francis and Brother Illuminatus after venturing into the territory of the Muslim army were taken prisoner and, upon their request, led to see Sultan Malik al-Kamil Nasir ad-Din Muhamad, who was the nephew of Saladin. (4) The Sultan initially thought they were either emissaries with a message from the Crusader army or vagabond monks were seeking conversion to Islam. Francis immediately declared that he was neither! In fact, he was an ambassador of God (i.e. not of the Crusader army!) and had come out of concern for the Sultan’s soul. Francis then spoke of God’s love. Apparently to the dismay of some of his mullahs, the sultan is captivated and by all accounts willingly listens. There may have been ongoing discussions between Sultan al-Kamil and Francis of Assisi over several days. 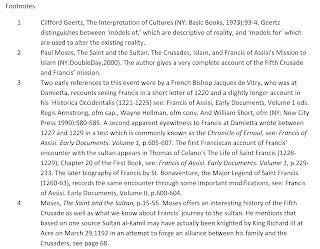 Eventually Francis and Illuminatus are sent back to the Crusader encampment, the trip ostensibly a failure as neither the sultan converted nor was Francis martyred. Nonetheless, rather than a failure we can see this encounter as showing us an alternative voice from Christian tradition which can offer insights as a model for interreligious dialogue. Check back Monday for the six attitudes we can take from this story to form the basis for genuine dialogue. A former missionary among the Akimel O’Otham in Arizona, Br. John has committed himself to the “mission charism” that Francis considered so important. He believes that God is manifest in all religions and cultures and that the missionary’s task is one of “mutual” mission; discovering the Christ who was present before the missionary arrived. Br. John teaches missiology at the Franciscan School of Theology, which is a member school of the Graduate Theological Union in Berkley, Calif.